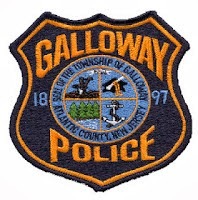 Galloway Township Police responded to 843 calls for service during September 7, 2014 through September 13, 2014. Additional statistics include: 2 Burglaries, 26 Motor Vehicle Accidents, 100 Tickets issued, 6 Driving While Intoxicated, 42 Arrests, 14 Domestic Violence, 13 Fire Calls, 98 EMS Calls and 0 Juvenile calls. Pamela J. Brennan, 42, of Galloway was arrested by Ofc. Brian Tennant for hindering apprehension and improper behavior on September 7. David A. Curtin, 22, of Galloway was arrested by Ofc. Bill Kline for possession of CDS on September 7. Andrew H. Uthoff, 37, of Galloway was arrested by Ofc. Ronald Gorneau for DWI on September 7. Kurtis Brown, Jr., 27, of Atco was arrested by Cpl Jerry Houck for possession of less than 50 grams of marijuana and hindering apprehension on September 8. Justin M. Hassan, 24, of Galloway was arrested by Ofc. James Mullholland for possession of less than 50 grams of marijuana and possession of drug paraphernalia on September 8. Lisa M. Halley, 43, of Galloway was arrested by Ofc. Kyle Kuhar for hindering apprehension on September 10. Justin M. Goldfarb, 18, of Galloway was arrested by Ofc. Steve Vernon for terrorist threats and harassment on September 10. Frederick E. Dupree, 43, of Galloway was arrested by Ofc. Scott Winneberger for distributing heroin/cocaine and possess CDS on September 11. Megan E. Williams, 22, and Nicole C. Barberi, 20, both of Egg Harbor Township were arrested by Ofc. Bill Kline for possession of CDS, Williams was also charged with possession of a hypodermic needle on September 9. Michael F. Pecoraio, 25, of Manahawkin was arrested by Ofc. Kevin Costa for DWI on September 11. Lisa M. Hitchens, 48, of Atco and Joseph M. Kehoe, 27, of Galloway were arrested by Ofc. Ronald Gorneau for hindering apprehension on September 12. David A. Sanchez, 37, of Galloway was arrested by Ofc. Ronald Gorneau for improper behavior on September 12. Eugene J. Moffa, Jr., 41, of Galloway was arrested by Ofc. Ronald Gorneau for possession of a hypodermic needle on September 12. Domenique Keith Washington, 68, of Somers Point was arrested by Ofc. Gary Brenner for possession of less than 50 grams of marijuana on September 12. James W. Allen, 33, of Galloway was arrested by Cpl Jerry Houck for DWI on September 12. Michael J. Williams, 41, of Egg Harbor Township was arrested by Ofc. Kevin Welsh for DWI on September 13.